Alexa Chung, model and former host of the MTV series of “It’s On with Alexa Chung” is back on a new TV show, Fuse News, slated to bow February 6. This is going to be a half-hour program running weeknights at 8pm Eastern Time on MTV. Cara Delevingne is on Ads of DKNY for Opening Ceremony SS13 collection. The ads are in black and white and the clothes show off the 90s spirit. The so-called First Male Vogue editor-in-chief Kullawit Laosuksri, but arguably Second after Franco sartori (1966-1988) of Italian Vogue, sells out Vogue Thailand first issue within days. Ricardo Tisci signs for 3 additional years at Givenchy and LVMH profits increase by 12%. “I feel I am in a dream; I feel I am in a cloud!” were the words of Alber Elbaz coming from a video call on Skype to check up on his SS13 campaign (starring Karlie Kloss with her short hair) because he couldn’t leave Paris to New York due to the arrival of hurricane Sandy according to WWW. Smurfette is showing her debut fashion line at New York Fashion week on February 13. The line will be stocked in Colette, Selfridges, Bloomingdale’s and Saks Fifth Avenue. 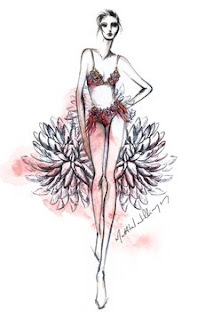 Matthew is collaborating with Triumph Lingerie for its London Fashion week by the end of February. The collection is very frivolous and fun. H&M is launching a higher end line called “& other stories” of higher quality but still at affordable prices. H&M aims to make the clothes a good keeper in your wardrobe… Will H&M get on top of ZARA, the world’s number one fast trend retailer giant? This is yet to see, the collection will be launched in Europe next spring.